Oliver Holmes is tackled by Mickael Simon in Castleford Tigers' game against Catalans Dragons from earlier this year. 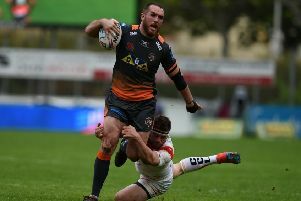 Castleford Tigers boss Daryl Powell wants his side to build some momentum now as they enter the run-in to what they hope will be a second successive play-offs appearance (writes Tony Harber). The Tigers are still taking aim on a second place finish and a home semi-final and could close back to within a point of Wigan if the Warriors lose to St Helens and Cas beat Catalans at the Mend-A-Hose Jungle on Saturday. “We’re in the top four, we want to stay there and we want to keep striving to chase Wigan down if we can. That’s going to need probably five wins I would say so we’ve got to be consistent now,” Powell told the Express. “There’s a real desire from us to build some momentum moving towards the end of the season. “We’ve worked pretty hard and people have stepped up to get us to this point. “We’ll have players back in the running to be in the squad this week who’ve been out for while and that will start to give us competition for places. “We’re in a great place to reach the play-offs, but it’s not just reaching the play-offs it’s doing something when you are in them. Powell acknowledged that overhauling Wigan would be a difficult task. He said: “Whether we can finish above Wigan is going to depend on them and us really. “They’ve got Saints this week and we need Saints to win that game then we’ve got to do our job. “We’ve got to tip the balance. It’s not in our hands now, it’s in Wigan’s hands. We didn’t beat them in the first game of the Super 8s and that gave them the opportunity to have it in their hands. “Regardless of where we finish we want to be in the top four and we want some momentum behind us – and that is in our own hands. Powell will be pleased if his team can recreate their previous display at home to Catalans back in April when they won 41-0, although the French club have improved massively since. He added: “The last time we played them at our place we played really well that day and they weren’t great.